I could not help but notice that the doc was challenged by Br James on WAF with reference to the spelling mistake on the stamp portion. 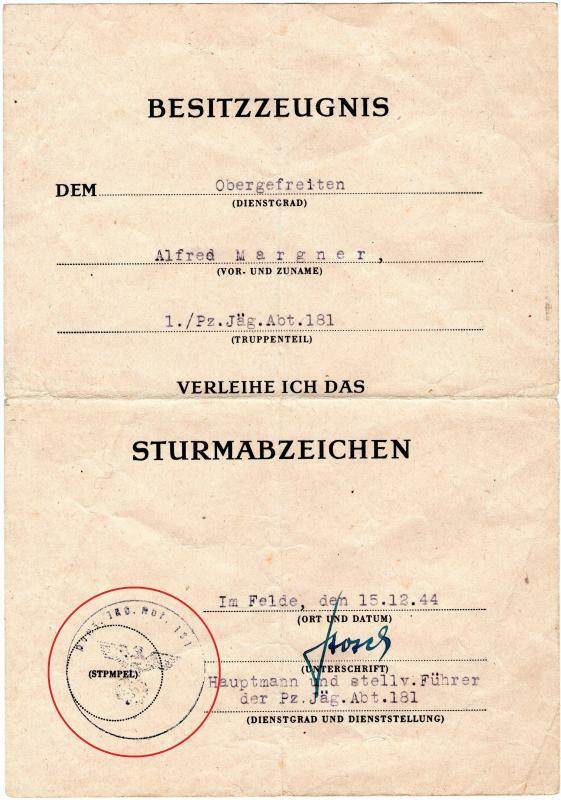 Could you reveal your source of the document, if not, did you obtain it privately or at a reputed site for example? And I've seen a lot of documents with the error on various forums. Do you have or have you seen examples that are from 'run of the mill' units not unusual stuff like your doc? Have you seen any docs in groups with WP or SB for example? Have you seen much of this and what are your views on it? I would be more trusting if it were a less exotic unit and the signature were more similar to yours on the database, I know signatures change all the time and you never get two the same from me but.....? Also for an 'Ad hok'/late unit to have a rubber stamp produced and delivered this close to the end rather than a FP Nr type stamp? Or am I overthinking this? It is also a lone doc or are there others out there? I know they got things wrong too though......... even spelling, I know how they feel! While I can't say I am happy with the Marienburg related citation I would need to see more of the grouping to rule it completely out. 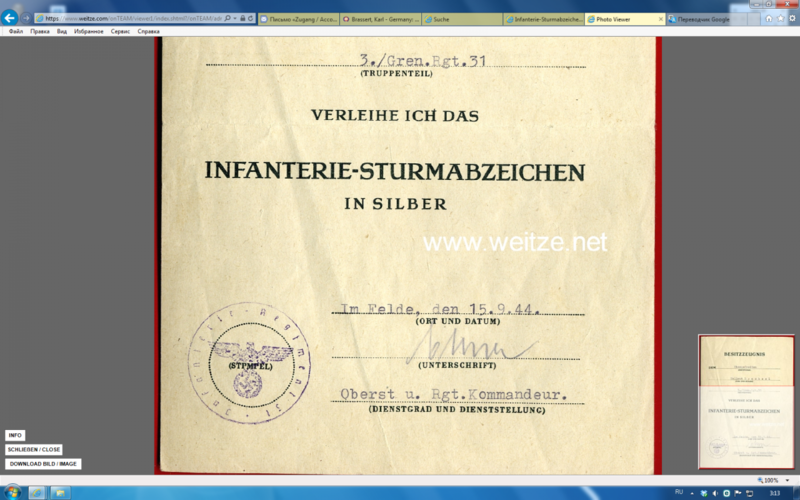 The thing is I also have problems with the other Sturmabzeichen citation from 81 ID, or rather nagging doubts. 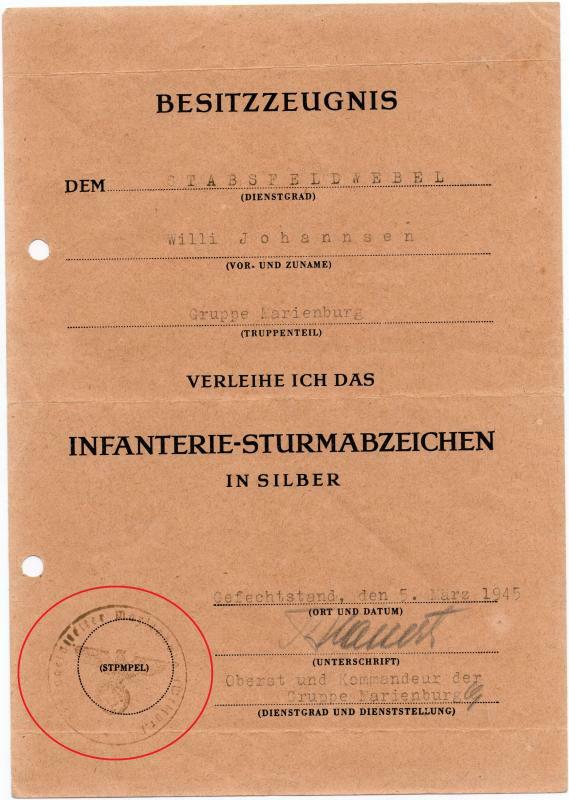 The ink and style used for the signature on the 81 ID strikes me as being very similar to a lot of very good faked citations coming out of Eastern Europe and what are the chances that one seller just happens to have two citations with a 'Stempel' misspelling even though the units didn't fight in the same area, one in East Prussia and one in Courland but without seeing the other examples from the group it is impossible to be certain. And Weitze isn't above selling faked or embellished items. 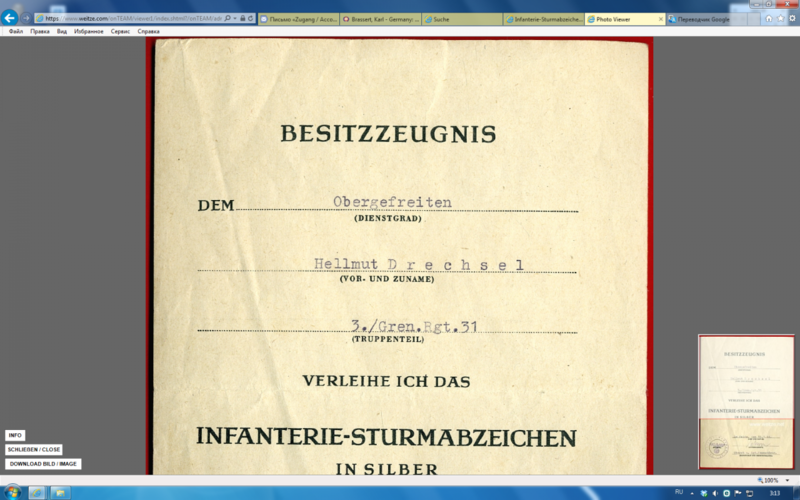 Just look at the Heer DKiG/TDB soldbuch he currently has listed. Yes, I know that Weitze sells faked items, on this and wrote "sorry" when referred to his store. Many thanks for information about fakes from Eastern Europe!